"LOOK at this bloody idiot coming down the road." Those were the words of Sunshine Coast man Allen Butler, 51, when he noticed a car travelling at high speed coming towards him. The two cars collided and seconds later he was dead. His passenger Audrey Williamson, 51, was left inside the twisted wreckage fighting for her life. Former Ipswich Grammar student Billy James Cody, 19, pleaded guilty on Thursday in the Brisbane District Court to dangerous operation of a motor vehicle causing death while adversely affected by drugs and alcohol. The court heard Cody had driven from his home in Ipswich on the morning of August 10, 2012, with the plan to take his own life overlooking Noosa Beach. He left his family home armed with prescription medication and alcohol. Crown Prosecutor Dennis Kinsella told the court what occurred after Cody arrived at the beach would have a devastating effect on three families. "He consumed the drugs and alcohol at Noosa Beach but it did not have the desired affect," he said. "He then got behind the wheel and started driving back the same way he came, driving about 13 kilometres before the crash occurred." Mr Kinsella said the crash occurred on a sweeping bending on the Cooroy-Noosa Road at Tinbeerwah. He said witnesses described the crash as an "explosion." "Witnesses said Cody was driving extremely erratically and at extremely high-speeds," he said. 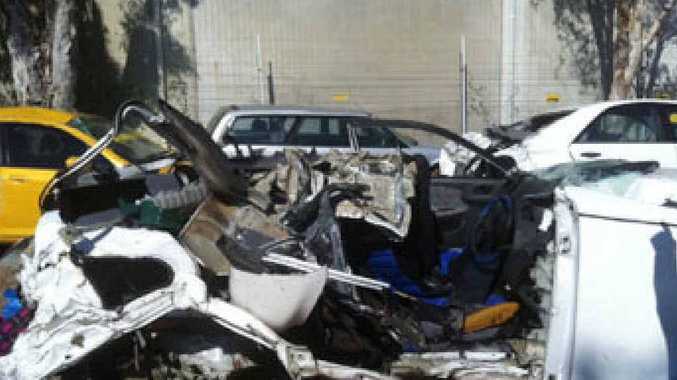 "The forensic crash unit later determined the two cars collided head-on with the combined force of about 170 km per hour. "Debris was strewn over a 63 metre section on the road." Mr Kinsella said the Crown had accepted Cody was not out to harm anyone else that fateful day apart from himself. "He immediately expressed remorse to police at the scene and asked them just to put a bullet in his head," he said. "Emergency services eventually had to sedate him at the scene. "Later in hospital he recorded a blood-alcohol level of 0.049 putting him over the legal limit because he was a P-plate driver." Defence barrister Christopher Wilson told the court Cody suffered from an autistic spectrum disorder. He said he did not have the skills to cope with the difficulties "raging inside his world." "He is a person who faces unique difficulties each day," he said. "He is a vulnerable person in the community and it is a no-brainer that he will be extremely vulnerable inside prison." Judge Sarah Bradley sentenced Cody to five years in jail but ordered he be eligible for parole after serving 18 months of the sentence. "Your actions had shocking and horrific consequences," she said. "I also understand due to your disorder you will be particularly vulnerable inside jail. "I have given that considerable thought but I do believe you need to serve a custodial sentence. "But do not think that the penalty I have imposed is in anyway the price I have placed on a person's life. "There are factors that are unique to this case that I have had to give serious consideration to." Outside court Audrey Williamson said she was glad this chapter of her life was finally over. "It has given me closure," she said. "I forgave the young lad a long time ago. "There have been no winners in this case unfortunately." - If you or someone you know is facing challenges contact Lifeline on 13 11 14.